Akshaya Patra kitchens bag CII National Food Safety Awards 2014! 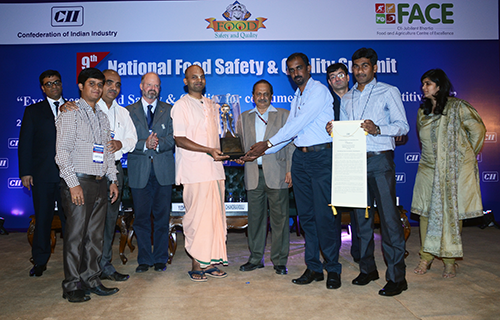 Home » Media Room » News » VK Hill and Hubli kitchens bag CII National Food Safety Awards 2014! VK Hill and Hubli kitchens bag CII National Food Safety Awards 2014! Akshaya Patra's Hubli and Vasanthapura (VK Hill) kitchens have been awarded the coveted CII National Award for Food Safety – 2014! The awards were presented at the 9th Food Safety and Quality Summit held in New Delhi on December 2nd, 2014. The VK Hill kitchen received the highest position of Outstanding Performance in Food Safety, and the Hubli kitchen received the award for the 2nd highest position of Certificate of Commendation for Significant Achievement in Food Safety. The award was conferred to Akshaya Patra by K. Chandramouli, Chairman, Food Safety & Standards Authority of India. Also present on the occasion were Mayank Jalan, Co-Chairman, Food Processing Committee and Chairman and Managing Director, Keventer Agro Limited and Kevin D. Gallagher, FAO India representative. Receiving the award on behalf of Akshaya Patra were Muralidhar Pundla, Yagneshwara Dasa, Suresh Kumar, Arun Kumar and Prashanth MB. The CII (Confederation of Indian Industry) National Award for Food Safety was introduced in 2010, and now includes social and improvement undertakings, and goes beyond good manufacturing practices and management of food safety systems. Large, medium, small and micro sized food manufacturing units, hotels, restaurants and retail outfits dealing with food products are eligible to compete for this award. The award highlights role models and identifies the 'Best in Class' in the manufacturing and food service organisations of India. It provides such organisations a platform for national recognition, and also allows participants to assimilate benchmark practices for future development. Speaking on the occasion, Muralidhar Pundla, Director – Quality at Akshaya Patra said, "Quality is of paramount importance at Akshaya Patra. It's an honour to receive this prestigious award from CII and that too, two awards in a single year. We at Akshaya Patra at the same time would like to keep our focus on Continual Improvement Programs to further strengthen our systems and processes to make sure that we can serve more children meals that they can relish every day." The kitchens were assessed based on approximately 500 indicators, divided over four categories. The criteria of evaluation ranged over topics like organisation efforts towards change management, compliance to statutory and regulatory requirements, commitment to the effective maintenance of Food Safety Management Systems, and use of Good Manufacturing Practices, amongst others.